The Jusupov Palace on the embankment of the Moika river is the real home of the aristocracy of the past, a pearl of the “old St. Petersburg”. Here you can feel privacy because that was not the official tsars’ residence but a cosy home for people who could afford whatever they would dream about. 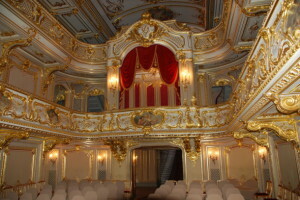 The palace is unique because one of its parts fully preserved the atmosphere of the “art nouveu age” which in Russia faced the beginning of the Bolshevik revolution. The first decades of the 20th century in the life of St. Petersburg elite were filled with mysticism, philosophical and religious search and cultural flourish. This period is known as the “silver age” of the Russian culture and can be fully perceived in the atmosphere of the Jusupov Palace. The last owner of this palace, Felix Jusupov was a really outstanding personality, a real son of his age. He dedicated himself to art and mysticism, he confessed that he could see ghosts of the departured people. He was tremendously beautiful but it was hard to stand “metallic glance” of his dark cold eyes. His wife, Irina Jusupova, was related to the royal family and possessed a special spiritual beauty. So now you are welcome to visit the home of Felix and Irina where they never came back after their emigration to Paris in 1917 but where their atmosphere is still perceived… Note: the visit should be booked in advance.